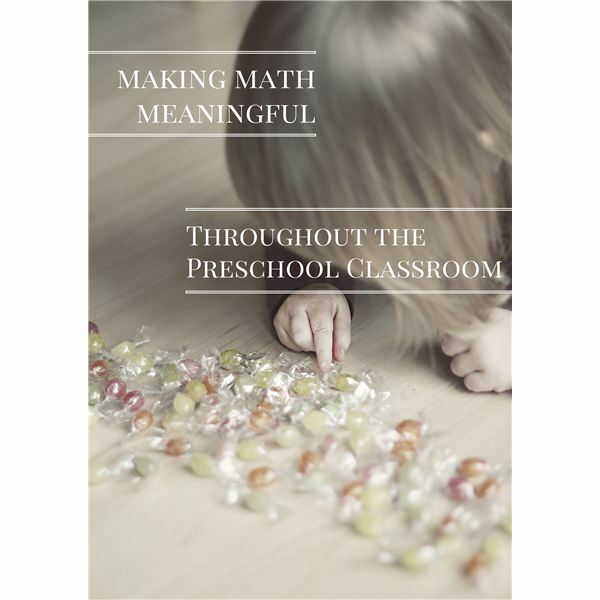 Math can be incorporated into every area of the preschool classroom. From making a road with blocks to race cars to passing out napkins at snack time to measuring who made the tallest marshmallow tower, math can be explored everywhere in meaningful and authentic ways. Children increase their problem solving, self-regulation, attention and memory, cause and effect comprehension and many other foundational skills in addition to emergent mathematics concepts through the opportunity to explore, at their own pace, interesting and inviting activities. They gain a deeper understanding of number value, quantity, size, measurement, estimation, patterning and data analysis when they solve problems in real situations. For example, it is easier to learn what the quantity five is when the child is placing five napkins on a table for five children. Creating a math-rich classroom in which children explore concepts such as shapes, sorting, patterns and quantities while playing and participating in inquiry-based activities makes the concepts real for them. These foundational math concepts can be incorporated into all centers or workstations throughout the typical preschool classroom. The math or manipulative center is the hub of math-focused activities that encourage exploration and learning. It can include counting objects such as buttons, shells, and coins, as well as puzzles, uni-fix cubes, pattern blocks, and teacher-made or commercial board games. Other items of interest may be geo-boards, tangrams, shape stencils and grid games. All of these play activities provide child-led play and exploration with math concepts. The block center is an ideal area for incorporating math-learning activities. Tape measurers or plastic links to measure the height of a block tower or creating street maps for the cars and blocks to make a town are simple ways to add math to the block area. A die with dots or numerals the child can roll to see how many blocks to add to his or her creation is another way to integrate counting, quantity and numeracy playfully. Spatial skills are encouraged by providing outlines of shapes with tape for the children to fill in during their block play. Science and math go hand-in-hand when it comes to preschoolers learning about the world around them. Using rulers to measure the height of plants or estimating the number of indented lines on a pumpkin are natural ways to include mathematical thinking and problem solving. Exploring symmetry in nature such as shells and pine cones, creating t-graphs of items to say if they are magnetic or not, sorting and classifying living and non-living objects, and keeping a weather chart to graph how many sunny, rainy or cloudy days are in a week are other ways to mat the science center more math supportive. Many high quality books include math concepts in ways that are meaningful and interesting to children. Some of the most popular examples include Caps for Sale by Esphyr Slobodkina, The Doorbell Rang by Pat Hutchins, A Remainder of One by Elinor Pinczes, The Grouchy Lady Bug by Eric Carle, and Inch by Inch by Leo Lionni. These books are great ways to review math concepts in real-world situations for young readers. Endless opportunities exist for incorporating math in the dramatic play center. One example of a dramatic play topic is creating a grocery store. The teacher can add balances to compare weights of the food, bags to fill and explore more/less concepts, boxes to count items to fill, and a cash register to press numerical buttons and play money to count when paying for the groceries. The teacher can role play with the children to encourage writing price tags with numbers, having the children sort and classify items as they put them on display in the store and have them count the total numbers of items they have for each category. Shapes, sizes and patterning should be included in a developmentally appropriate art center. Providing paper in a variety of shapes as well as shape stencils provides opportunities for geometry and matching. Cutting paper into smaller sizes entails half/whole (fractions) and seriation of sizes. Gluing objects onto a collage project can review counting and sorting concepts. Symmetry can be explored by painting on paper and folding it in half. The opportunities are endless! The teacher’s role is to encourage mathematical thinking and problem solving. This is done by creating a math-rich classroom with intentional activities and by appropriate dialogue and questioning strategies. Teachers must plan and prepare an environment in which the children will intrinsically become involved in activities that are conducive to mathematical explorations. In addition, teachers must provide input that supports higher-level thinking in young minds. Math in preschool should not focus on the “right answer," but on the quest for more knowledge and understanding. By asking such questions as, “Why do you think this happened?" or “What do you see here and how can you change it?" helps to build mathematical reasoning. A teacher’s role is to plan, prepare and provide dialogue to support mathematical knowledge in the preschool child.